Because of the importance of the healthcare system for the biosurveillance conducted by governmental public health, it is worth considering here, at the end of two chapters, these two pillars of biosurveillance and the current status of their integration. Ideally, the two domains would exchange relevant data bidi-rectionally and in real time. The healthcare system would transmit data needed for outbreak detection, characterization, and management (e.g., bed status, treatment status of victims) to governmental public health. Governmental pubic health would transmit data needed by clinicians for case detection (e.g., case definitions and up-to-the-minute information about population health relevant to diagnosis of individual patients) to the healthcare system. The data exchanges would be secure and satisfy the ethical requirement of "minimal need to know'' and a patient's rights to confidentiality. In addition, the workflow processes related to detection and characterization of outbreaks would be distributed optimally across both domains to maximize the efficiency and speed of the biosurveillance process. Most clinicians are capable, for example, of making observations needed to complete a case-investigation form, but at present this is a task conducted by a health department. Considerable efficiency and speed-up may be possible if IT were to enable a physician to elicit and record more epidemiologically relevant data about a patient with hepatitis A at the time the patient presents in the office setting. This level of integration is many years in the future and requires a rethinking of current systems that takes into account the potential of IT to enable conceivable, but previously impossible, configurations of organizations and workflows. The need for such integration has been understood for many years, and widely accepted since the anthrax postal attacks of 2001. That such integration is feasible technically has been proven beyond the shadow of doubt by the success of the IHIE and other RHIOs. It is therefore reasonable to ask whether the progress has been satisfactory, given the resources that have been devoted to the problem. Has the progress been exemplary, the best achievable, or less? 18 They define an achievable National Health Information Network as an information system that enables physicians to review the results of testing done in both an inpatient and outpatient setting, review and update both inpatient and outpatient medical records, order treatments including medications, verify the eligibility of patients for various services under their health insurance plans, communicate with patients securely (for example, secure email), and transmit prescriptions electronically to pharmacies. 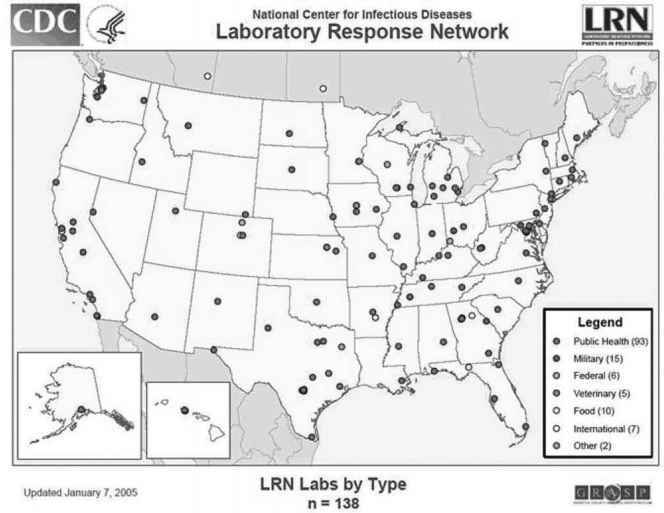 The current status, four years after October 4,2001 (the date of public awareness of the first case of inhalational anthrax from contaminated mail), is that the healthcare system by and large continues to report notifiable diseases to governmental public health by using forms that must be completed manually. There is an increasing trend toward the forms being online, but the workflow process for the reporting clinician is otherwise unchanged. There are many syndromic surveillance projects in which the healthcare system sends minute quantities of data (de-identified ED registration records) to health departments. A handful of the more than 5,000 hospitals in the United States send laboratory data electronically to governmental public health. Earlier in this chapter, we identified barriers that in part explain the gap between what is and what could be.They include the recording of data on paper only (especially in outpatient settings), the sheer number of hospitals, the numerous departmental information systems within each hospital, nonstandard data formats, and the low market penetration of the types of information systems of most value. It may be instructive to examine just the integration that should exist between laboratory information management systems and governmental public health. As we discuss in Chapter 8, laboratory test orders and results are highly automated in most hospitals. There are many firms that are in the business of creating interfaces between laboratory information systems and other information systems in hospitals. Although it is true that significant effort is required to create an interface, the effort is finite and the cost is in the neighborhood of $100,000 (Overhage et al., 2001) for a comprehensive interface (one that covers all laboratory tests). The cost would likely be lower for an interface that covered only results of interest to biosurveillance. Even were the cost to be as high as $100,000, the total cost for 10,000 interfaces (more than the number of hospitals in the United States) would be $1 billion dollars. One of the authors in fact presented this option to President Bush in February 2002. The President's DHHS advisor quickly interjected that DHHS already had a plan to send $1 billion to the states to address the problem of bioterrorism. Since then, the federal government has provided several billion dollars to the states for bioterrorism preparedness. This example suggests that an additional barrier at present may be the direction that the government is taking.As discussed in Chapter 5, the government because of its power to tax and enact law, is essential to the creation of systems for the public's good. Such systems cannot come into being without the leadership of a government. However, the leadership must lead in the right direction. The idea that governmental public health should provide the leadership for the integration of the healthcare system for biosurveillance may be a barrier to progress. Governmental public health organizations have different priorities at present. Their biosurveillance priority, and perhaps rightly so, is to integrate their own systems and to connect to other governmental public health organizations and governmental laboratories so that they can manage outbreaks. Their evolving plan for integrating the healthcare system at present is to connect each hospital electronically to a health department and to leverage RHIOs should they exist. The CDC is also advocating a plan to connect hospitals directly to the CDC and then route the data to health departments. This may be the wrong idea for biosurveillance. An alternative approach would be for every hospital and healthcare provider in a region to link with each other (the RHIO model) and then create a single connection from the RHIO to governmental public health. The oldest RHIOs have been in existence for more than a decade and have solved many technical and administrative barriers to regional exchange of data. The healthcare and pharmacy organizations within the regions have far more technical capability to create such connections than does a health department. As nongovernmental organizations, they have more flexibility and in some cases more resources. A key advantage to the RHIO model is that it avoids the construction of two separate but redundant infrastructures: one for public health purposes and one for clinical care. The alternative model of governmental public health creating a separate biosurveillance infrastructure misses the opportunity for a dual-purpose system, which would also be more mission critical to the healthcare system and therefore promoted to a higher priority for both development and long-term maintenance.